This post is part 5 of a 6 part series featuring Experience Columbus Days , which takes place Oct. 8-11. During that time, Columbus attractions offer 50% off (or in some cases, BOGO or free admission). Plus, the restaurants of Dine Originals Columbus offer 25% off your food bill for two people. In this post, Cathe features things to do that are fun for the entire family during Experience Columbus Days. 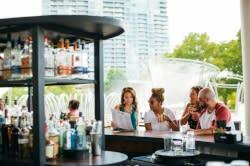 You can also check out previous posts that feature delicious dining options , plus outings that are great for groups , great for dates and perfect for art fans . Stay tuned for the last post in the series - we’ll feature Experience Columbus Days activities that are recommended for history buffs. With 50% off admission (or BOGO) at so many attractions, it’s crazy not to take the entire family—kids and all—out and about during Experience Columbus Days. It looks like we’re in for good weather this weekend but regardless of how it shapes up, there are both indoor and outdoor options. COSI is an obvious one. You’ll definitely find something for everyone at this hands-on science center, from classics such as the pendulum and high wire cycle to newer exhibits such as Ocean and Gadgets. And, I’m really excited to see the new traveling exhibit, Clifford the Big Red Dog. Who doesn’t like Clifford? When it’s time to burn off some steam, the kids can let loose at Magic Mountain Fun Center/Polaris . Whether it’s putt-putt, racing cars or video games, a little friendly competition never hurt anyone. Another of my favorites is the Wilds in Cumberland. Although it’s a bit of a drive (located southeast of Zanesville; about an hour and 15 minutes from Columbus), it’s worth it. Where else can you visit rare and endangered species from around the world living in natural, open-range habitat? Take the Safari Transport Pass and see giraffe, rhinos and antelope. It’s hard to believe you’re in Ohio and not Africa. Adults and kids will get a kick out of the Santa Maria , a full-sized replica of Christopher Columbus’ flagship moored on the riverfront in downtown Columbus. Climb aboard and learn how life was like on the long voyage across the Atlantic. Haven’t made it to the Columbus Zoo and Aquarium to check out the Polar Frontier exhibit? Well, now’s your chance. Voted the #1 zoo in America by USA Travel Guide, there’s so much to see. Crowd pleasers are the Kangaroo Walk, Manatee Coast and, of course, the lowland gorillas. Just last week, a baby gorilla was born. It may not be on display yet but you can at least say hi to Colo. At almost 54 years old, she’s the first gorilla born in captivity and the oldest. If you’re looking for fun event, check out the Columbus Italian Festival . In addition to great food, there’s entertainment all weekend, including Rick Brunetto Big Band and American-Italian. Note: You must have one flyer per person and a maximum of two flyers per group. At this year’s festival, they’re trying for the Guinness Book of World Records for the largest meatball. Seriously. And something new this year is the Huntington Park Culture Fest , which will take place on Saturday afternoon. It’s an international festival, in that all of the cultures represented right here in Columbus will be participating with entertainment, food and dance. Keep in mind that the special discount is valid only noon-2 p.m.
Don’t forget to keep your discount flyer with you all weekend long! You must present it to get these great deals.